The first thing that you’ll notice is the voice. It’s a powerhouse, gritty yet soulful, dripping with the raw emotion of a hundred lifetimes. The next thing that you will notice are the songs. They are vaguely familiar yet captivatingly new. 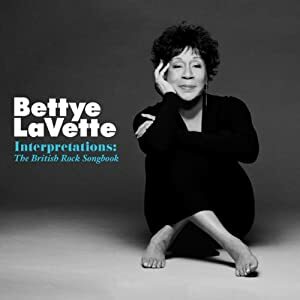 Bettye LaVette’s Interpretations: The British Rock Songbook is a tour de force. The premise is simple, turn LaVette loose on a slew of classic rock standards. The masterful singer tackles everyone from Lennon & McCartney (“The Word”) to Elton John & Bernie Taupin (“Don’t Let The Sun Go Down on Me”) and David Gilmour & Roger Waters (“Wish You Were Here”) to Mick Jagger and Keith Richards (“Salt of the Earth”), layering on a raw and expressive emotion that re-defines each song. I don’t think that I will ever hear Led Zeppelin’s “All My Love” the same way again, heck, I’m not sure that I want to hear the original anymore. The collection also includes LaVette’s stunning live Kennedy Center Honors performance of the Who’s “Love Reign O’er Me” that left Townsend and Daltrey awe-struck. Consider this a warning to singer-songwriter’s everywhere: when Bettye LaVette tackles your song you will hear it performed in ways that you’ve never imagined… and you might never want to perform them yourselves again. It’s hard not to hear an Apples in Stereo song and not break into a smile. Singer-songwriter Robert Schneider knows his way around a pop song, mining the classics for inspiration: Some of guitar from the Who, arrangements by ELO and sunshiny harmonies from Cheap Trick. Throw in a little extra cow bell and you’ve got a hit in the making. The Del-Lords were a bit before my rock and roll years but it doesn’t mean that I appreciate them any less. Especially when I’ve gotten to see the band’s two impressive guitarists go on to solid, if under-recognized, individual success. Eric Ambel went on to produce or perform with artists ranging from Steve Earle to the Bottle Rockets to Joan Jett. Scott Kempner released a couple of fine solo albums and played with Willie Nile and Dion. It says a lot about the Del-Lord’s reputation. These tracks, the first from Kempner and the second from Ambel, come from a collection of recent recordings. Keep it coming, boys, it sounds great. I’ve always appreciated Jon Dee Graham’s satirical wit, gravelly voice and razor-sharp guitar. Both can shred anything in their path. When joined with the forces of good, however, they rock with a distinct flair. Your secret is out Jon Dee. One of rock’s biggest cynics can sometimes be… an optimist. We almost lost Jon Dee in a car accident last year (the album title is apparently what he said to the emergency first responders). It’s good to have you back. After two releases with his band, the R&B-infused Southern Cousins, Nakia sits down behind the piano for a emotion-packed solo performance. Recorded live at SXSW this past March, it is the perfect showcase for the Austin musician’s soulful side. It’s hard to go wrong when you take one of New Orleans funkiest contemporary bands and match them with some of the city’s most legendary performers. In this case it is legendary soul singer Irma Thomas joining the boys for one super-sized helping of funky R&B. About the author: Mild-mannered corporate executive by day, excitable Twangville denizen by night. Get weekly updates and more from Twangville by subscribing to our email newsletter.